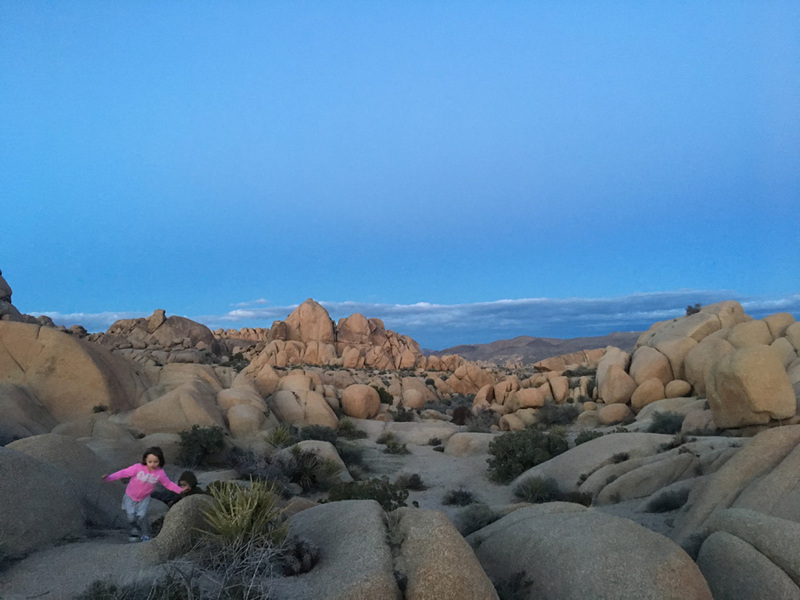 Joshua Tree is an enormous out of this world outdoor playground. 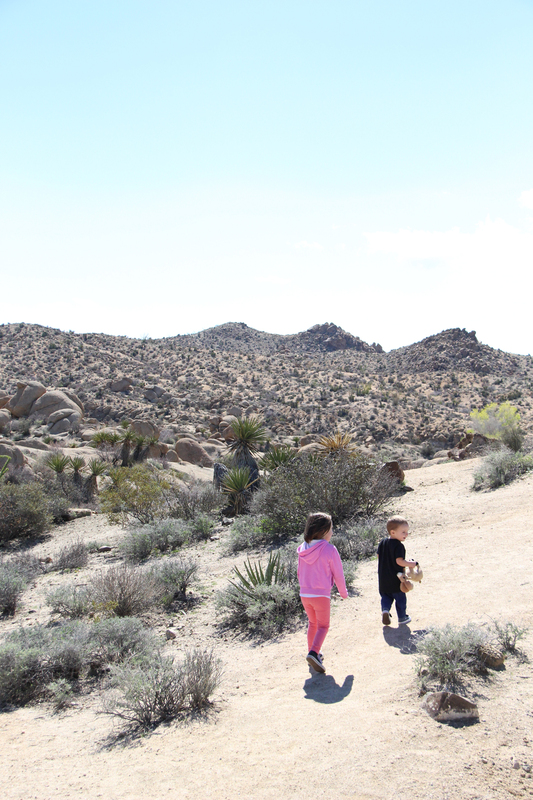 Jumbo rocks, cactus gardens, beautiful canyons, easy to access trails, a palm oasis and the Junior Ranger program made our trip to this National Park amazing. Our first stop was the Oasis Visitor Centre to get the low down. This turned out to be quite fun and informative. There are interactive activities and exhibits inside and a small giftshop. 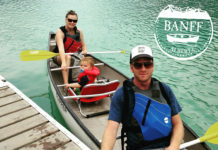 The park staff were very helpful in directing us to a campground and suggesting activities and sights to see. They also hooked us up with the Park Newspaper which has a map of the park that we used throughout our visit, as well as weather info and fun facts. Both our kids picked up a Junior Ranger book (more on that below). 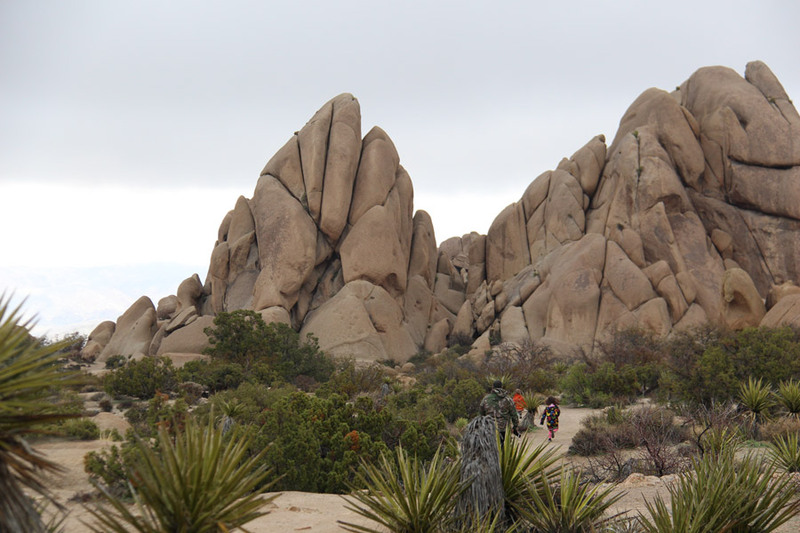 We did an easy trail walk to Skull Rock from our campsite at Jumbo Rocks. There were signs all along the way highlighting different plants and animals. 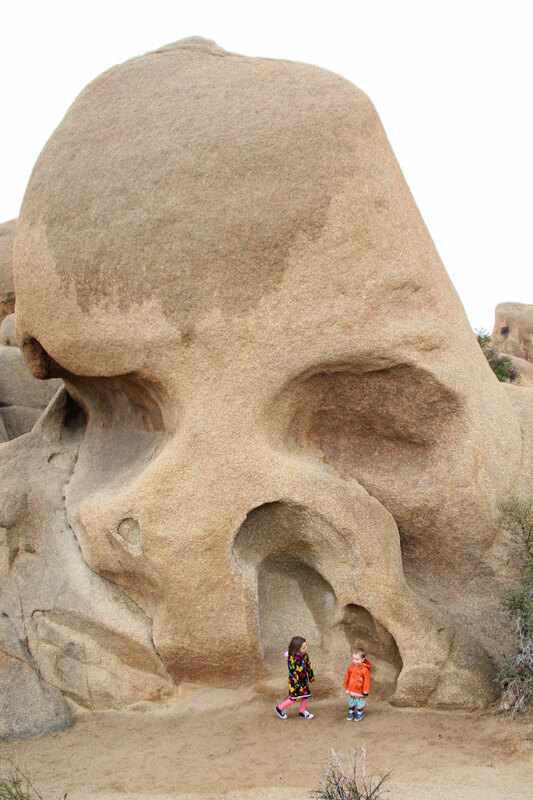 boulder piles, desert washes, and a rock formation known as Skull Rock which was a great photo opp and fun to find. Before heading south we drove to Keys view, which offers breathtaking views of the San Andreas Fault, Mount San Jacinto, Mount San Gorgonio, and the Salton Sea on a clear day. 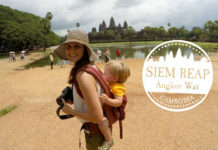 There is an accessible overlook right where you park your vehicle, as well as a short, paved path that is a bit steep, but you could bring a stroller. Unfortunately it clouded over and started raining as we headed that way so our view was a big canyon of fog. 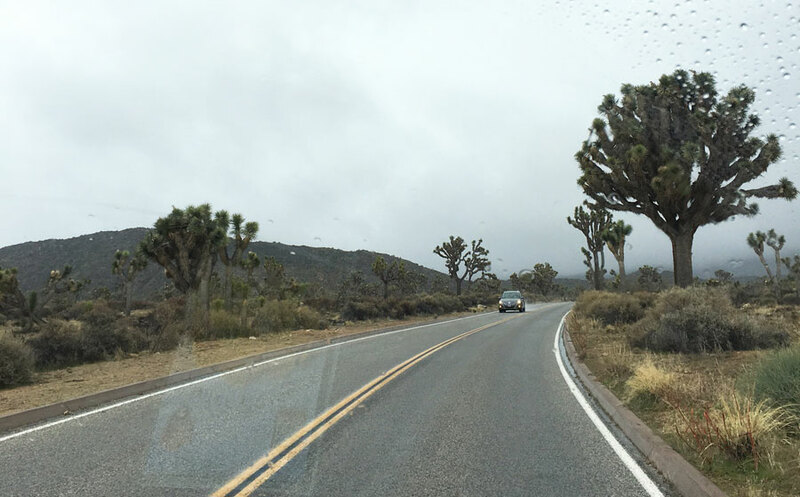 The drive was still really cool as you go past some of the expansive joshua tree forests with some of the largest joshua trees in the park. 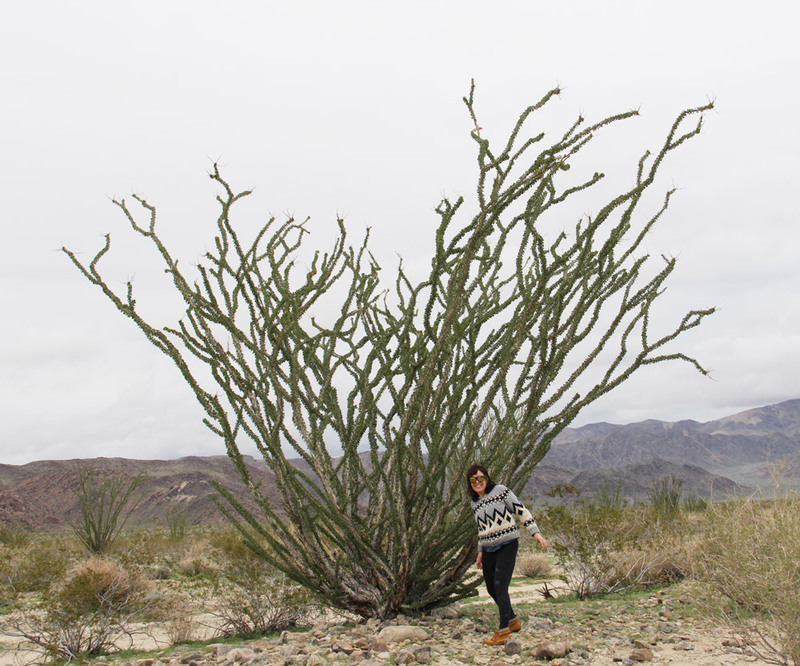 This natural cactus garden has thousands of densely concentrated cholla cactus with a short 1/4 mile (400m) trail through the prickly patch. 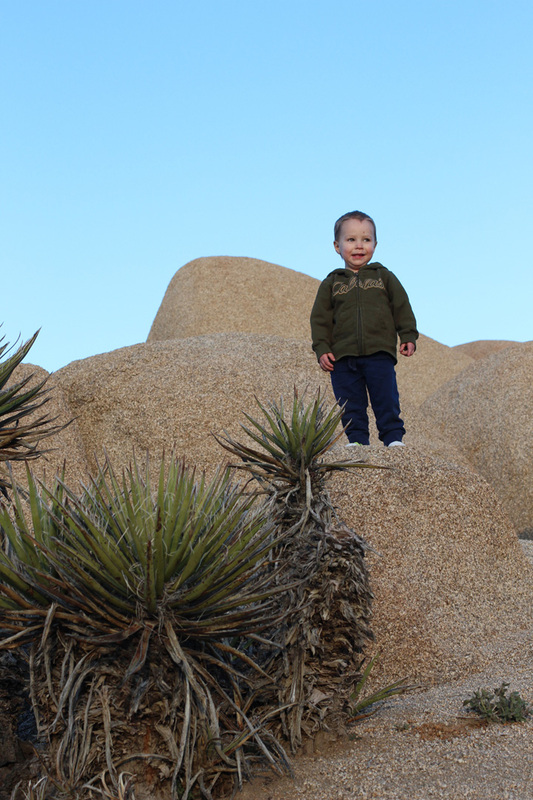 If your kids happen to be sleeping, the cacti come right up to the parking lot so you can hop out for a quick view and snap some photos without waking them. Shortly down the road is a patch of really cool looking plants called Ocotillos that we also stopped at, marked on the map as “Ocotillo Patch”. 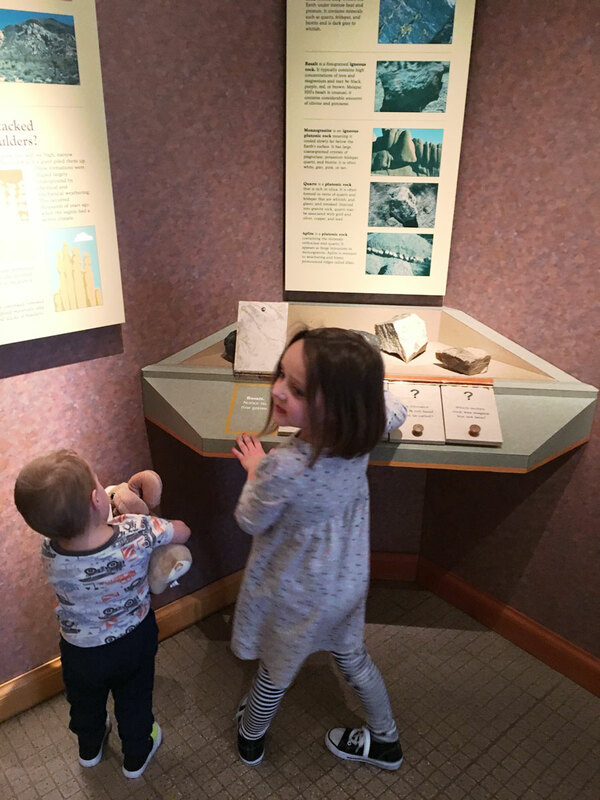 On our last morning we visited the Cottonwood Visitor Center which similar to the Oasis Visitor Center has informative displays and a gift shop. The memorable part of this visit was that my daughter got her junior ranger badge. Cottonwood Spring Oasis also called Lost Palms Oasis features a short trail to a fan palm oasis and cottonwood trees, as well as other plants and animals of the Colorado Desert. There are great viewing opportunities just a few feet from the parking lot and longer hiking trails of varying lengths leading to higher viewpoints. We hung out at this refreshing spot for about an hour, doing a leisurely walk through the palms and up one of the trails. 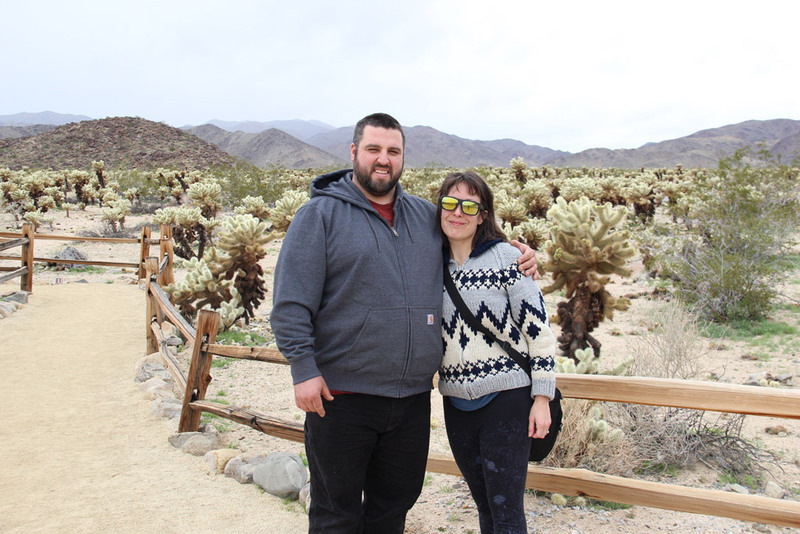 We enjoyed the informative signs about the history of the Cahuilla Natives who have frequented the oasis for hundreds of years, as well as gold miners. Cottonwood Springs is one of the best birding sites in the park too. I first heard about the Park from cousins who visited with their kids and came home with some gorgous starry landscape photos of the park. 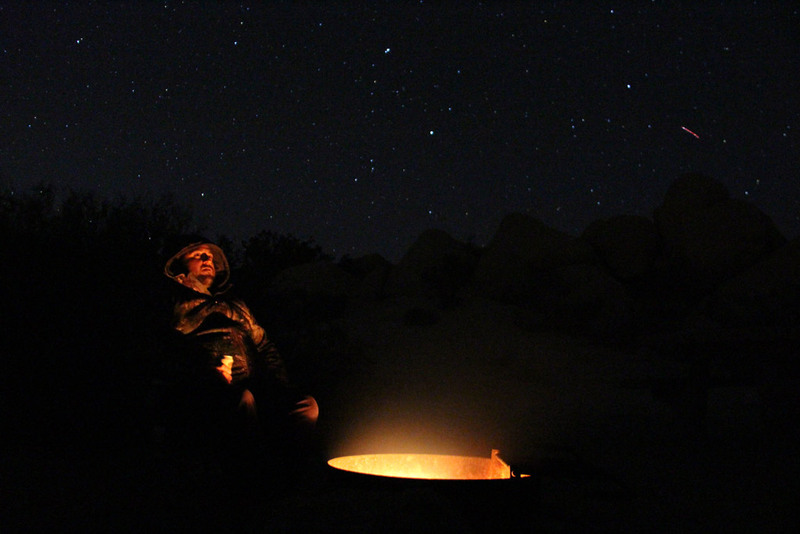 (The photos definitely inspired me to visit the park) It has some of the darkest night skies in Southern California and I loved sitting around the firing admiring the starry skies at Joshua Tree. 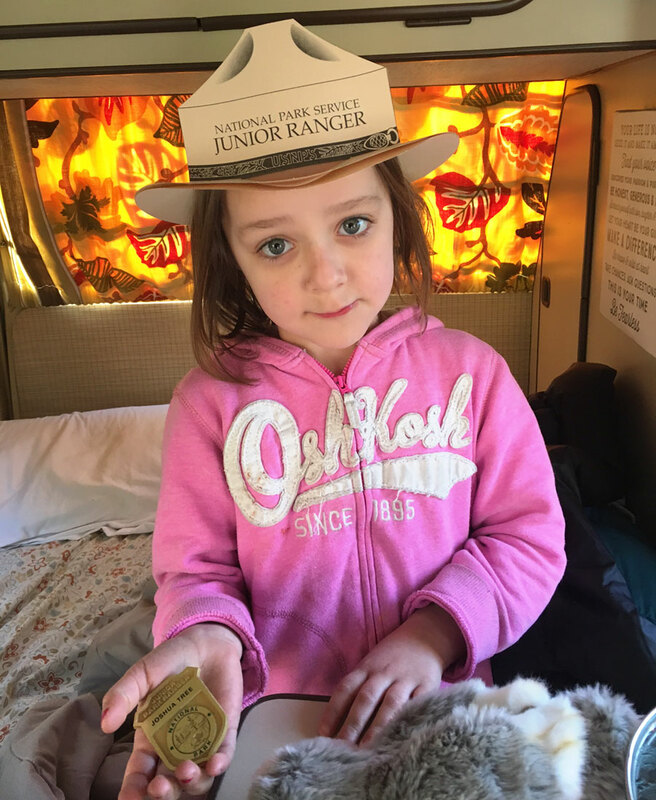 This awesome Junior Ranger Program offered in many national parks provides young visitors the opportunity to join the National Park Service “family” as Junior Rangers. 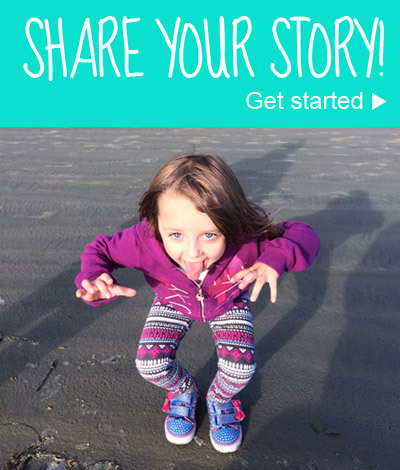 My daughter loved it! The Junior Ranger book helped us all learn a bit more about the park and includes activities such as drawing, writing, attending a ranger program, and picking up trash in the park. On our last morning we stopped in at the visitor centre. One of the park rangers gave my daughter an age appropriate quiz of things she’d learn (loosely based on the activities in the junior ranger book she got when she entered the park) and she recited an oath (to protect parks, continue to learn about parks, and share their own ranger story with friends and family.) Then she received the badge and a paper ranger hat – they also gave us an extra hat for my little guy who was sleeping in the van with Dad. 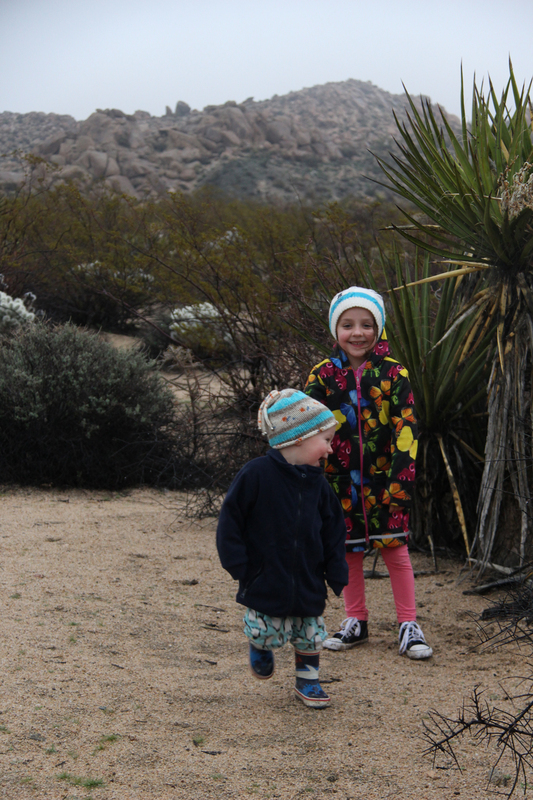 She also got a cool book called “A Joshua Tree Named Lily” which is a great souvenir that we still enjoy. 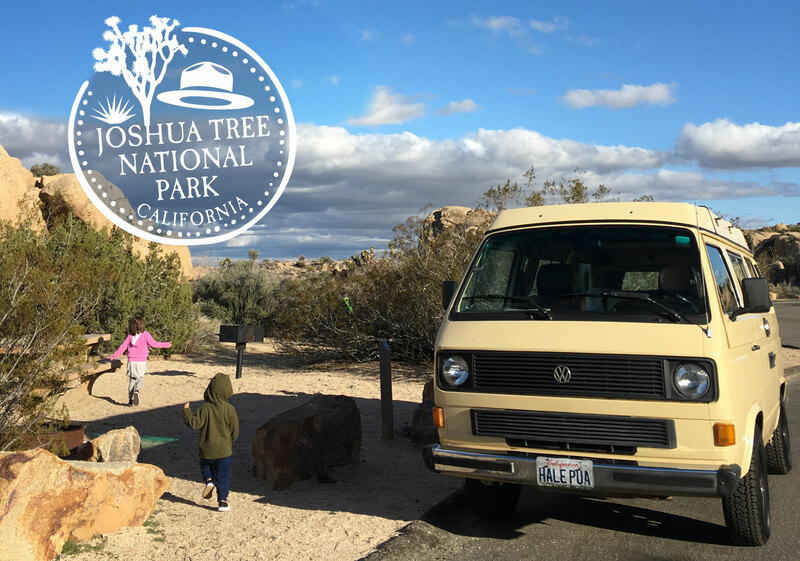 Joshua Tree National Park has 8 campgrounds, and we stayed in two of them – Jumbo Rocks and Cottonwood Spring. You can also rent a hotel or AirBnB just outside the park in 29 Palms and the town of Joshua Tree which are right by the north entrances. About 40 minutes – 1 hour from the south entrance are a number of resorts and hotels in the cities of Desert Hot Springs, Palm Springs, Palm Desert, La Quinta, and Rancho Mirage. 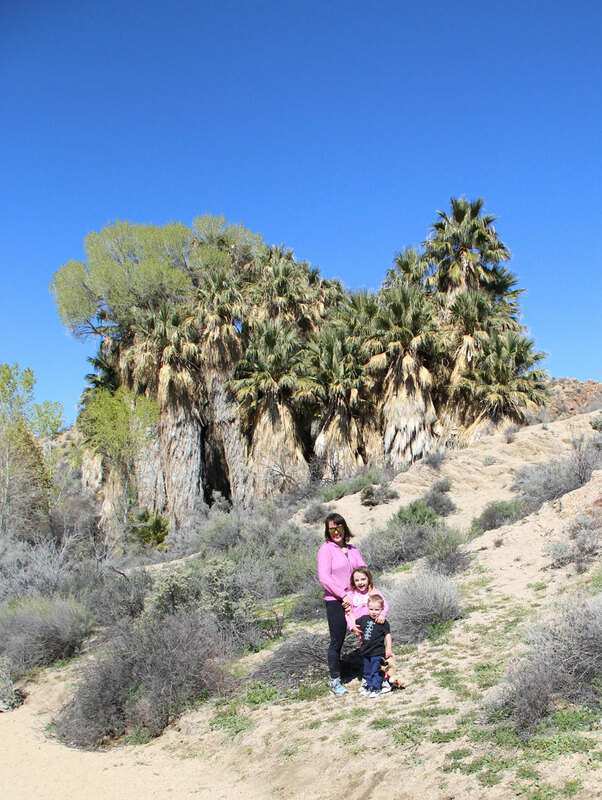 The helpful staff at the Oasis Visitor Center recommended Jumbo Rocks Campground as a family friendly place to stay. 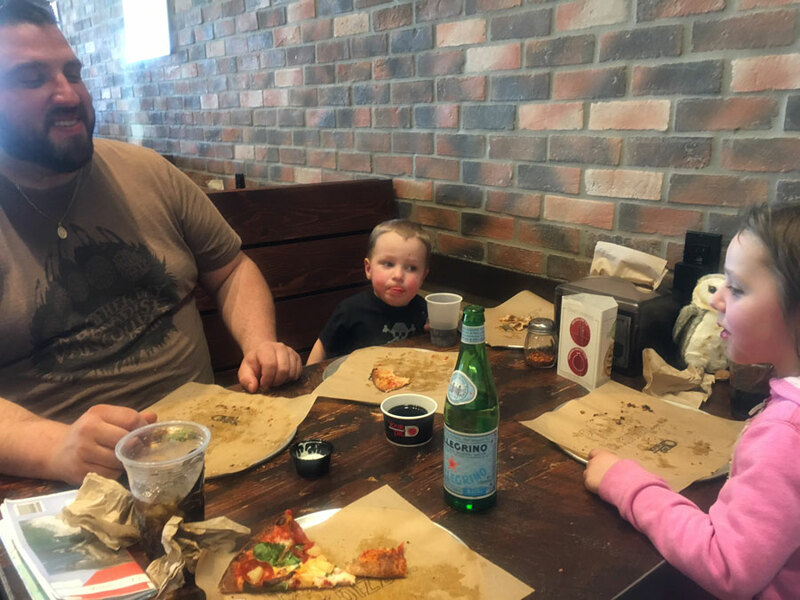 It was a good choice and there were other families around. Our campground had lots of room and backed onto some of the huge rocks that the campground is named for. After the long drive we had a beautiful afternoon climbing and exploring behind our campsite. In the middle of the night it got really windy. 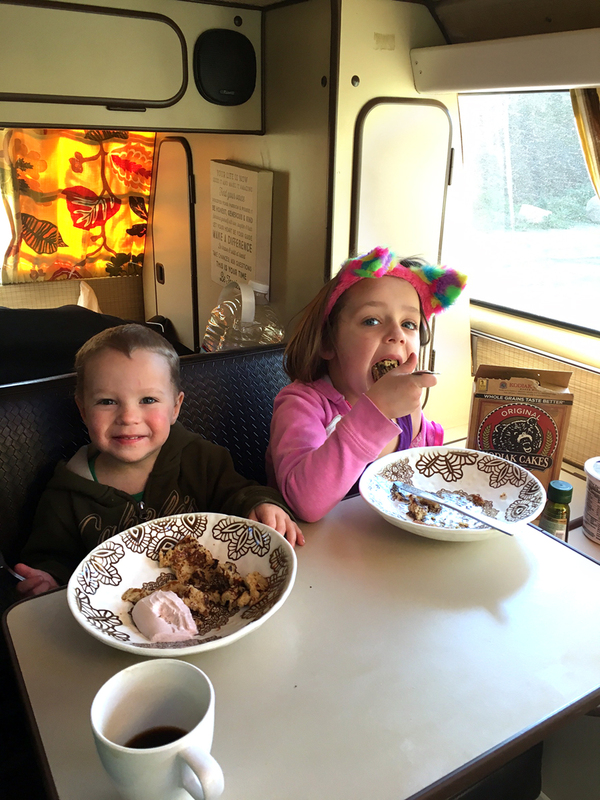 The kids were sleeping on the top bed of our Van and we were a little nervous about them blowing away so we ended up leaving the next day. I’m not sure if it gets that windy very often and it wouldn’t have been an issue if we’d been in an RV or even a tent on the ground. Cottonwood Spring is in the Colorado Desert (rather than the Mojave Desert like the northern part of the park) and the landscape is quite different. 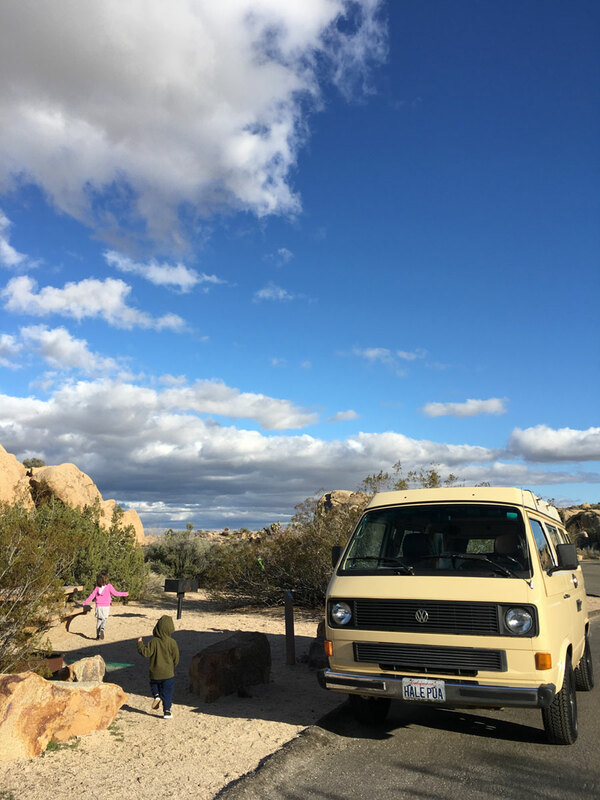 If you are staying in the Palm Springs area, this is the closest campground and is only about a 20 minute drive from the Southern entrance of the park. 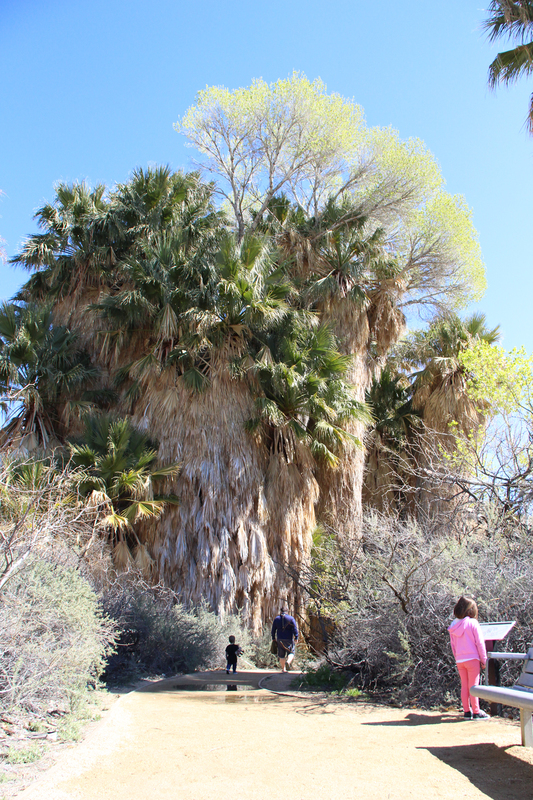 The campground has lots of small trails and desert washes to explore and the big attraction is the nearby Cottonwood Spring Oasis. 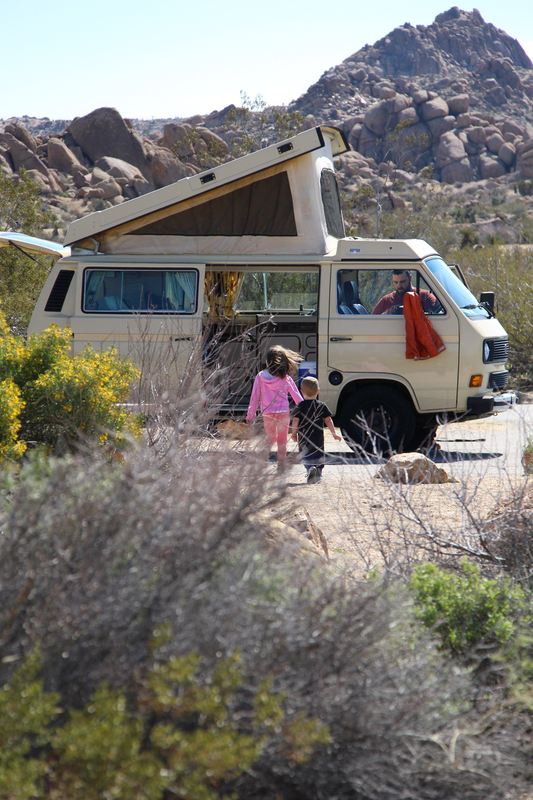 We flew to Los Angeles and rented a VW Westfalia Van from vwsurfari.com – we booked the flights before the van. If I did it again I would fly to John Wayne airport which is way closer to the Van rental place. 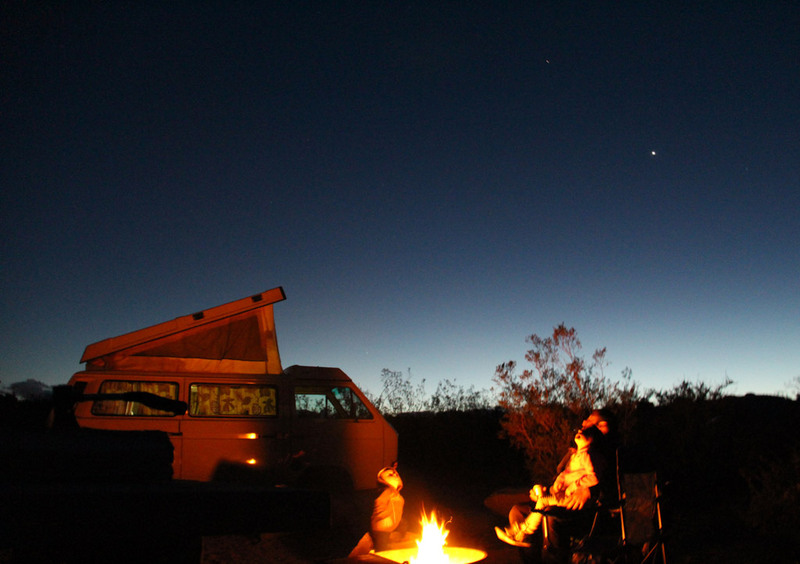 We travelled, slept and ate in the van, which came equipped for camping and it was an amazing experience. 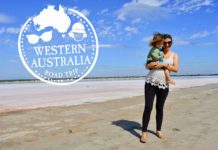 The VW Surfari folks were super helpful and we had so much fun travelling in our van for the week. We visited at the end of February and it was close to freezing at night, and shorts and tank top weather in the day. We also experienced a very rainy afternoon. If you go in the winter be prepared for hot and cold weather (think warm layers, extra blankets and rain jackets). The summer can be scorching hot. 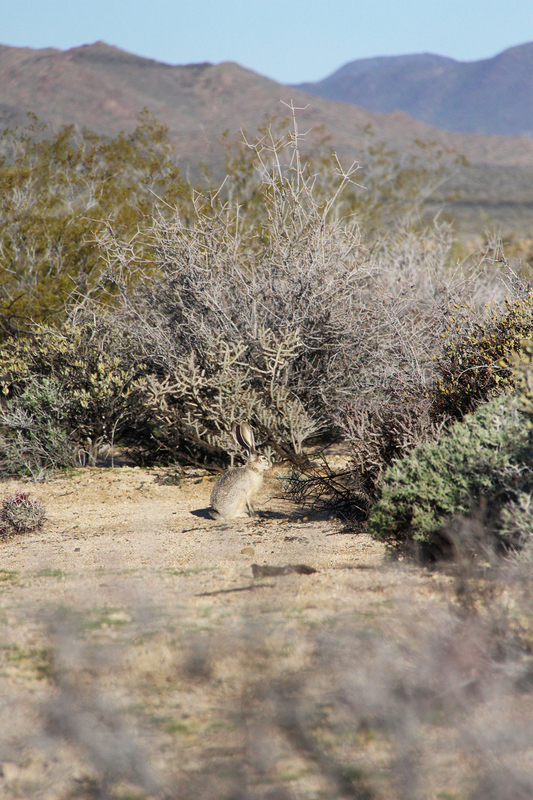 It is a desert with extreme temperatures so do a little research about the time of year you plan to visit. Some of the campgrounds have no water so bring lots with you. Even though there is lots of sand in the campgrounds you are not allowed to dig holes so leave the buckets and shovels in your vehicle. There are lots of wildlife spotting opportunities so it’s fun to have a pair of binoculars.